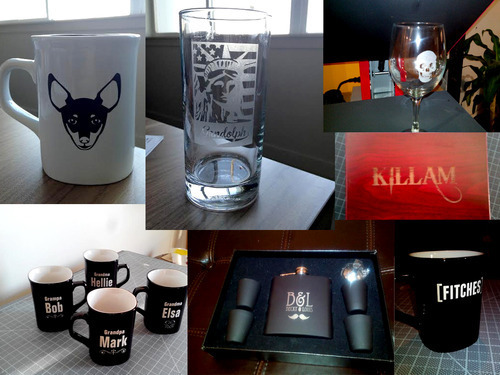 Mugs, Tumblers, USB Storage, Glassware, Metal, Flask, Ipods, Ipads, Zippos, trophies, badges, door numbers, building directories, wood to name a few. In the picture above shows a couple of items that have been laser engraved, also for indoor advertising we would cut individual letters out for wall mounting and other applications up to 11.5"x17.5" each letter or number from 1/8in acrylic or 1/4in syntra. © 2019 Fitches. All Rights Reserved.